On my first visit to Jaffa LA for their “friends and family” preview, we took a seat on the patio where baskets of blankets were nearby to wrap ourselves in as it got chilly. 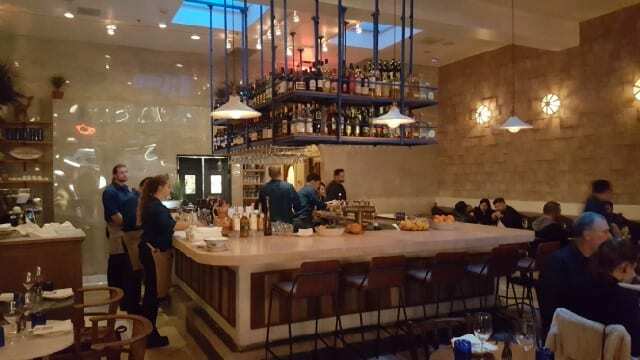 We started with drinks, choosing from an eclectic international wine list, which includes Israeli wine, cocktails and mocktails. 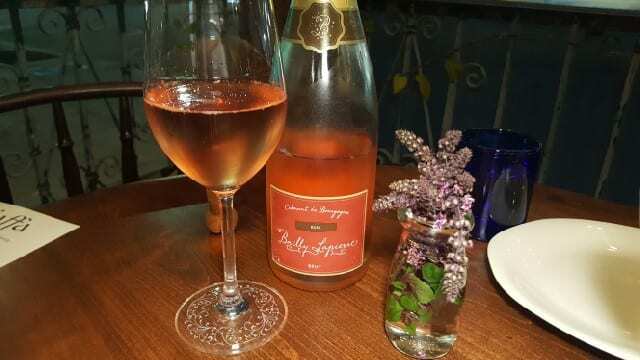 A glass of sparkling pink Bailly-Papierre NV Cremant de Bourgogne, France was the way to start. But do not miss the cocktails. 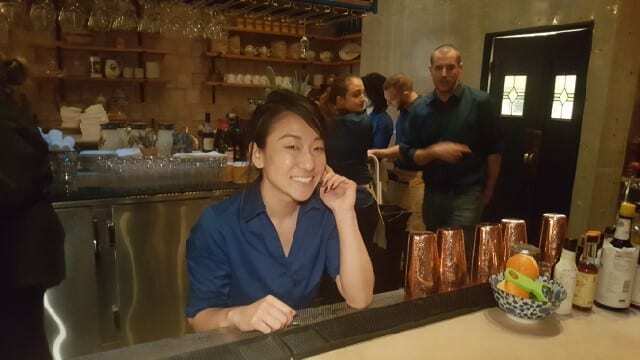 Aly Iwamoto is the lead bartender. Having worked at The Varnish and Here’s Looking at You, Aly is a talent behind the large marble bar that dominates the restaurant. From the “Fig” with Evan Williams Bourbon, Jamaican Rum, fig and Bergamont bitters to the “Grape” with Dolin vermouth, green grapes, Arak, black lime and sparkling wine, the cocktails will entice you. 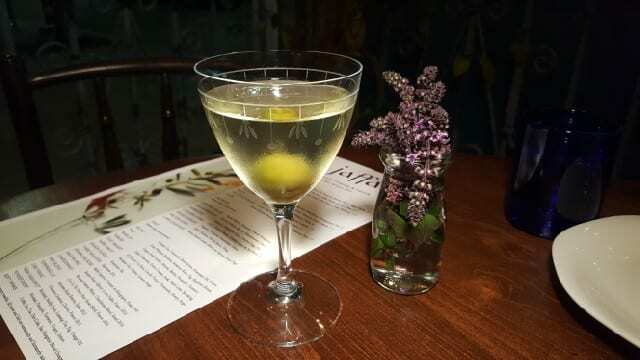 We went with the “Olive” with Bombay gin, vermouth, Benedictine, rosemary oil and lemon. As a Welcome, we ordered the Hummus. 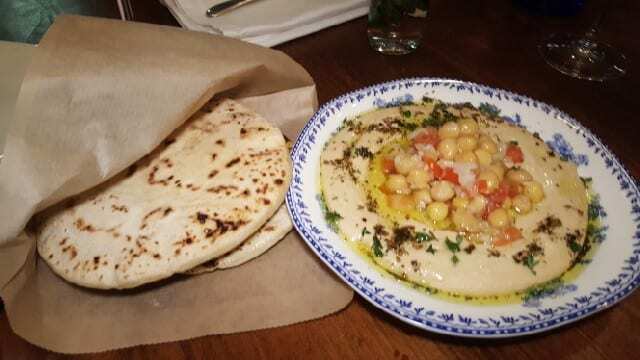 The hummus was served room temperature with zatar, olive oil, tomatoes, onions and whole garbanzo beans, just like I had it when I was in Israel. The Salatim are cold dishes served as a course in Israeli cuisine. 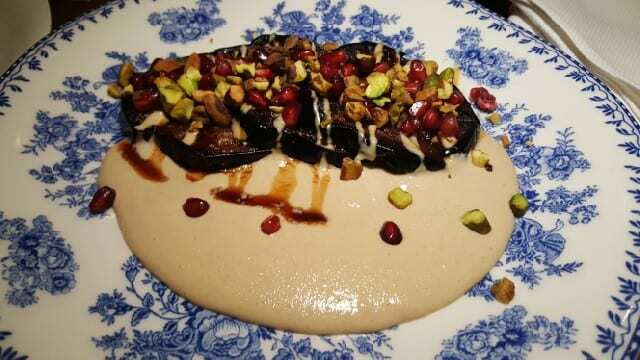 The Tahina with charred eggplant, pistachios, date syrup and pomegranate was a favorite. The sweet tartness of the pomegranate added a hint of brightness to the earthier nuttier notes and the eggplant almost melted in the mouth. The Beets was a dish that pleasantly surprised me. I like beets but find beet salads to be a bit boring and flavorless. 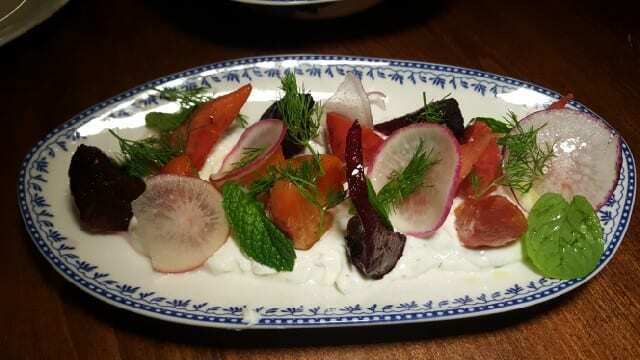 However, these charred baby beets and radishes are tender and flavorful and sit on top of herbed labneh that you will want to lick up every last drop. 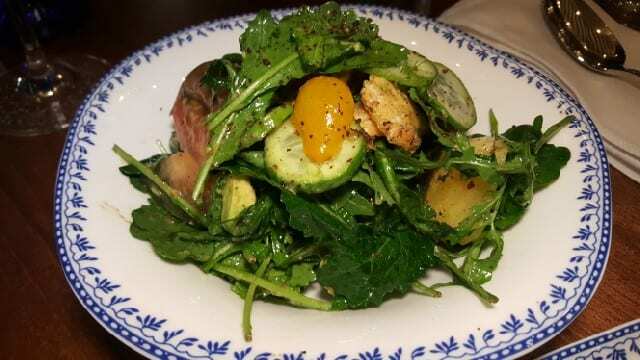 Fattoush Salad is a simple salad of avocado, pita croutons, cucumber and tomato with sumac vinaigrette but it is light, refreshing and has bright citrus notes. The Entrees, like the other sections, include vegetarian and vegan options. We started with the Matzoh Soup. I love matzoh balls but am rather critical as I think my grandmother made the best ones. But, these were quite good. 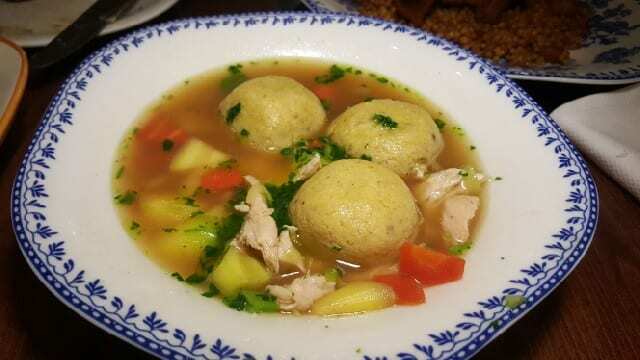 The matzoh balls were dense and yet light and full of seasoning and then served in a chicken broth with jidori chicken, Hawaij spice and zhug. 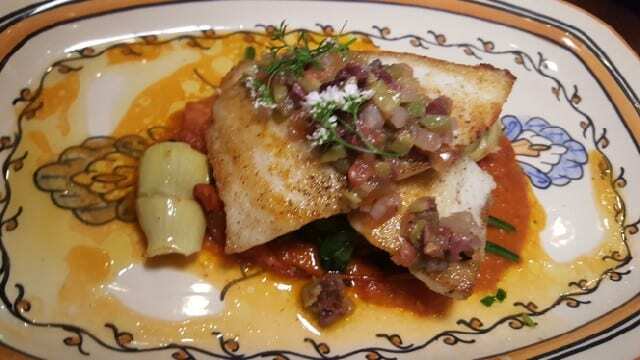 The Spiced Dorade is a delicate white fish served with peppers, tomatoes, artichokes and olives. The sauce was definitely one of my favorites. 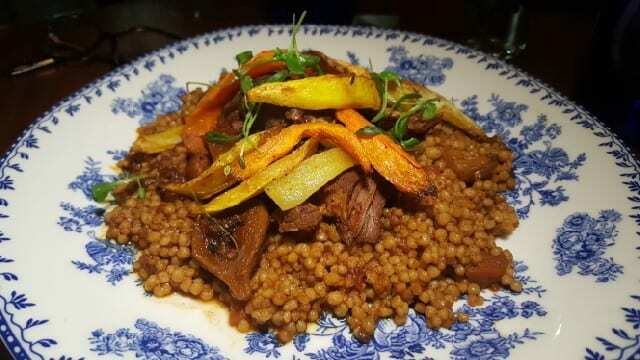 The Lamb Couscous is prepared with Niman Ranch lamb, moroccan spices and dried figs. The lamb has sweet notes of cinnamon which pair nicely with the large pearl couscous, the sweet figs and the earthy roasted vegetables. Mediterranean flavors and fresh ingredients make Jaffa LA a wonderful addition to West 3rd Street, and Los Angeles as a whole. This entry was posted in Cocktails, Food, Wine and tagged Aly Iwamoto, Anne Conness, Cocktails, food, Israeli cuisine, Jaffa.LA, Salatim, West Hollywood, Wine by Allison Levine.